There was SO much more on Native American Lesbian sexuality that I found fascinating, I had to do another post on this! 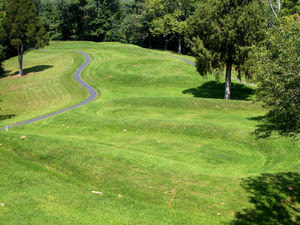 Signs of this Deity remain scattered all over the continent: Snake Mound in Ohio is probably one. And get this: The oval-to-head area of the serpent is aligned to the summer solstice sunset and the snake’s coils align with the winter solstice sunrise, the autumnal and spring equinox sunrises, and the summer solstice sunrise! Take a close look at the map - see the circle by the Serpent's mouth? No one knows what that is or was - some historians think it might have been a platform for ceremonies to take place. A dyke's initiation takes the same course as a male's: She is required to pass grueling physical tests, to lose her mundane persona, and to transform her soul and mind into other forms. The Lakota have a word for some of these women, koskalaka, which is translated as "young man" or "woman who doesn't want to marry," in our terms, "dyke." These women are said to be the daughters (the followers/practitioners) of a Spirit/Divinity who links two women together making them one in Her power. They do a dance in which a rope is twined between them and coiled to form a "rope baby." The exact purpose or result of this dance is not mentioned, but its significance is clear. In a culture that values children and women because they bear them, two women who don't want to marry (a man) become united by the power of the Diety and their union is validated by the creation of a rope baby. That is, the rope baby signifies the potency of their union in terms that are comprehensible to their society, which therefore legitimizes it. It is clear that the koskalaka are perceived as powerful... When this power is used to determine other's actions, it at least borders on black magic or sorcery. I can imagine such a Lesbian Marriage Ceremony, on a raised platform in front of the gaping jaws of the Serpent Mound. Two koskalaka, proud, beautiful, in love, dancing with their rope and twining and twisting it to form the image of a child. Their chanting tribe surrounding them, the air swirling with embers of fire, the pounding of drums, and magic! The quotes are from pgs. 114-115 of Paula Gunn Allen's essay "Lesbians in American Indian Cultures" in "Hidden From History: Reclaiming the Gay and Lesbian Past" edited by Martin Duberman, Martha Vicinus and George Chauncey, Jr.
Information on the Serpent Mound came from this wikipedia entry. I also found an interesting article about Native American Lesbians now on Curve magazine's website. This is so cool. I'm not gay but I am writing an Advanced Middle Grade Fantasy using a lot of Native American Mythology. I think it may be better suited to your work, but I'm getting the cleaned up stuff. I am a portrait artist and specialized in Native American portraiture for thirty years. Anyway, your blog is great. My stories include a native aboriginal woman in an australian lesbian story. I am trying to authentically portray the wisdom and medical uses that our native sisters have used for centuries.